Combine evaporated milk and morsels in medium, heavy-duty saucepan. Cook over low heat, stirring frequently, until morsels are melted. Remove from heat; stir in vanilla extract. 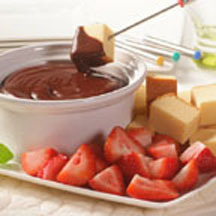 Serve warm as a dipping sauce for fresh fruit or spoon over ice cream or cake. Store remaining sauce tightly covered in refrigerator.